When Saddam Hussein’s forces occupied Kuwait in August of 1990, a ten-year old Rana Abdul-Aziz was on vacation in the United States. Her father, a civil engineer, had been offered a month-long training opportunity in Massachusetts with his new American employer, and her parents were happy to exercise their newly granted freedom to travel outside of Iraq. The family checked in to their hotel looking forward to a brief stint in a foreign country. When they turned on the television the next morning, they were shocked to see images of the Iraqi army in the streets of Kuwait City. The eruption of the First Gulf War made a return home too risky for the family, but they remained hopeful that the situation would soon favor repatriation. Yet, it would be thirteen years before Rana would land on Iraqi soil once more. In January of 2001, at eighteen years old, she traveled back to a Baghdad far different from the city she remembered. The trip was arranged through Conscience International, an organization focused on humanitarian aid and human rights advocacy. Their aim was to deliver medicines and school supplies—and to document conditions in Iraq for the international community. Rana knew Iraqis were suffering under economic sanctions, but she was shocked by the pervasive sense of isolation and depression. Rana’s own education was quite a journey. She spoke no English when fate tossed her into the American public school system, but by the end of her first year, she was learning alongside her peers. Now she holds a bachelor’s degree and a master’s in education from Tufts University, and she has been teaching Arabic to undergraduates at her alma mater for nearly a decade. 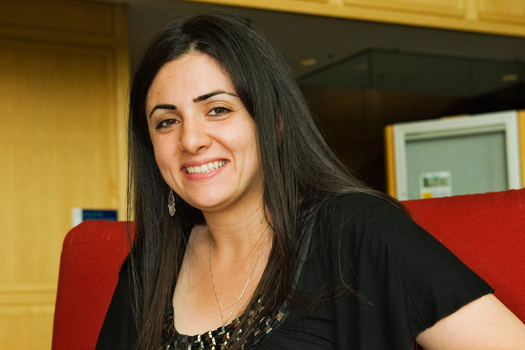 Rana was inspired to study Hebrew during a stint in Israel a few years ago, working as a program coordinator for the University of the Middle East, an organization dedicated to conflict resolution through higher education. A summer as a Kathryn Davis Fellow in the School of Hebrew in 2008 gave her valuable language skills—and helped her become a better teacher of Arabic, by putting her back in the learner’s shoes.